Afinal a Primavera ainda não chegou. Foi falso alarme mas já há flores e sabores que aguardam a sua chegada. Spring has not sprung, after all. False alarm but there are, already, flowers and flavors waiting for its arrival. Knead all ingredients with your fingertips. Roll out the pastry to about 2mm thick. Cut a circle. Bring to preheated oven at 180 ° for about 25 minutes. Levar a polpa de fruta, o açúcar e ovos ao lume, mexendo sempre até engrossar. Retirar do lume e juntar a gelatina previamente hidratada. Envolver a manteiga partida em pedaços e emulsionar com a varinha mágica. Colocar em moldes de silicone com a forma pretendida e congelar. Bring the fruit pulp, sugar and eggs to heat stirring constantly until thickened. Remove from heat and add the gelatin previously hydrated. Wrap the butter in pieces and emulsify with the wand. Put in silicone molds and freeze. Ferver as natas com as sementes de baunilha. Verter sobre o chocolate partido em pedaços e misturar. Refrigerar por algumas horas. Bater na batedeira até ficar bem firme. Boil the cream with the vanilla seeds. Pour over the chocolate broken into pieces and mix. Refrigerate for a few hours. Beat in the mixer until very stiff. Sobre a base de tarte colocar o cremoso de maracujá e manga e a ganache de chocolate branco. Finalizar com cubos de manga fresca. Pode optar por cozer o sablée numa tarteira, colocar o recheio de manga / maracujá e cobrir com a ganache de chocolate branco. 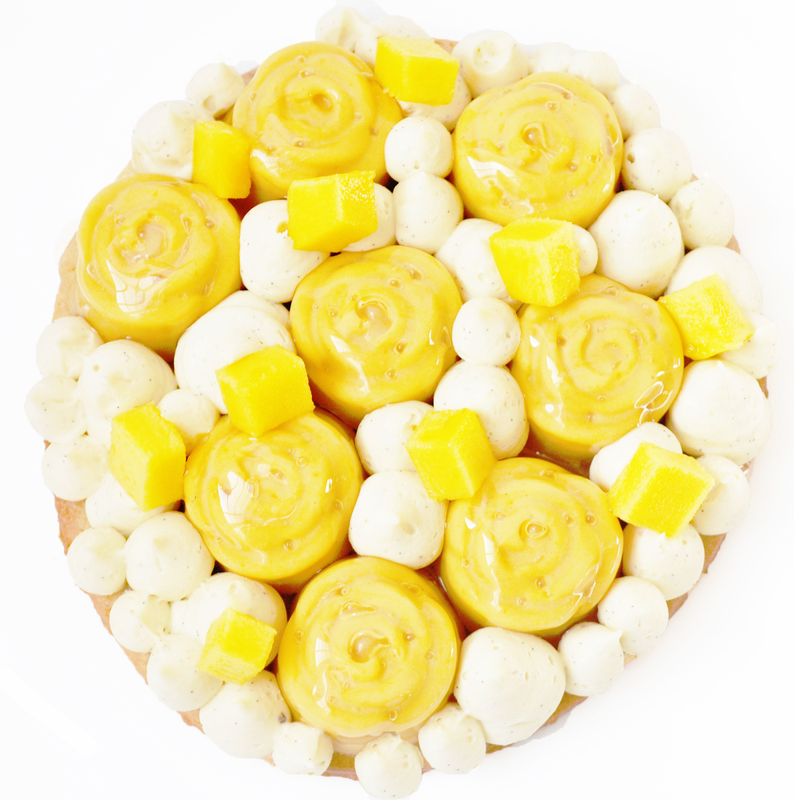 Cover the pie crust with the mango / passion fruit cremeux and the white chocolate ganache with a pastry bag. Top with fresh mango cubes. You can choose to bake the sablée in a pie pan, fill with the cremeux and top with the ganache.